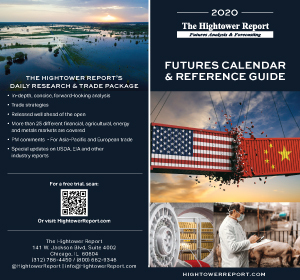 Hightower Report Pocket Calendars are now available for purchase on-line! An invaluable resource that fits in your pocket for only $5. To order customized versions or quantities more than 10, please call 800-662-9346. For over 15 years we have been publishing our popular Pocket Calendar. It was developed as a result our Commodity Trading Guide customers also wanting a convenient “pocket sized” reference to carry with them. We have created over a thousand different customized, customer specific, versions of this great resource. Each side of the cover is yours to design – so you can to send the message you want to your clients and prospects. “Thank you” gifts for existing customers. Printing is in-time for holiday shipment! Give-Away piece to use at trade shows, presentations, or industry functions. Targeted marketing for lead generation and conversion. A great reference tool for your in-house brokers, traders, IB’s and staff. A customized, company-branded piece that is functional and will keep you “top of mind” with your customer base. A one-stop reference for the major report dates, contract expirations, trading hours and more! Convenient pocket size to carry with you or be “at the ready” on your desk. Shipping is easy and inexpensive. The calendar fits in a standard business envelope. Call 800-662-9346 with any questions and to place your order today!